Fetcham Park is a luxurious location for your brand. However, you don't have to be here to take advantage of it. With Virtual Offices at Fetcham Park, you can elevate your profile with our prestigious Surrey business address and a dedicated phone number. Bring our historic reputation to your stationery, without the cost of physical space. Give your business a personal point of contact with our telephone answering, ensuring you're only ever just a call away - even if you work from home or on the move. It's not just a way to look more professional. It's a way to align your business with something truly prestigious. or the one you're building. Favourable rates on formal and informal meeting room space. At Fetcham Park, we’ve retained tradition but added the latest technology. Our IP telephony system is based on the industry-leading Avaya Aura platform. With powerful iOS and Android apps, you can integrate your desk phone and your mobile phone into a seamless telephony platform. You can use a single number whether you’re in the office, at home, or on the move – and even bring your existing phone number with you. In addition, our end-to-end fibre gigabit internet circuit delivers outstanding upload and download speeds, all protected by a service level agreement that guarantees consistent performance. A virtual office gives you the advantage of our respected address and a point of contact that builds customer confidence and trust. At the same time, we're here to support you with tailored, personal services to make your virtual office as productive as your physical one. Let us to look after your calls while you put your energy into your business. We'll answer the telephone in your company name and transfer callers to your number, so you make the best first impression on clients and colleagues. It's a welcoming point of contact that shows your customers you're always just a phone call away. There's no need to sit by the phone or wait in for that important delivery. Instead, leave us to take care of it. We'll automatically redirect incoming calls to your number and receive your incoming mail, so your customers can reach you at our iconic location. Even if you're not there yourself. If you run your business from home or on the move, don't let that affect your reputation. Fetcham Park can be your prestigious point of contact for clients and colleagues, with your mail forwarded to your address or held for collection. So you can use our Surrey address – without being at our address all the time. Set the right tone for your meetings, or get private, productive space to work in. When it's time to go hands-on or meet face-to-face, our choice of stylish offices and meeting facilities are ready and waiting. What's more, our existing virtual office clients get preferential rates on our flexible space. With a virtual office, you can get the benefits of a prestigious address and point of contact, without the expense of physical space. Just choose the package that suits your requirements, from simple mail forwarding to a Client Service Representative to answer calls in your company name. Virtual offices start from £38 per month for mail forwarding. Contact us to get a quote to match your business needs. We'll call you back to discuss your requirements. 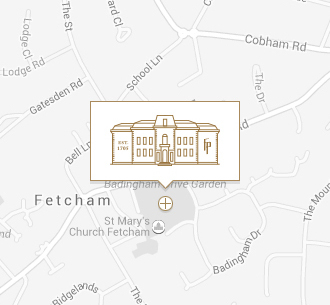 Fetcham Park is tucked away from the distractions and noise of the city, yet is situated close to the M25/A3 and less than an hour from London, Heathrow and Gatwick airports. Our tranquil meeting rooms and serviced offices offer the perfect setting for business. Fetcham Park is an historic building fully equipped for modern business. Our meeting rooms and flexible office space offer the latest IT and telephony systems that keep you connected in an environment that’s reassuringly traditional. At Fetcham Park Surrey, you can spend your time on your business and turn to our specialist teams and premium concierge service when you need help – from local knowledge to prestige meeting and event management.